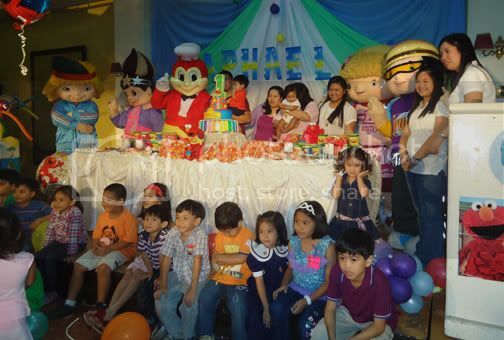 An Elmo birthday party with all the mascots of Jollibee! We attended a birthday party last week with the Elmo theme. It was held in a rented venue but little did we know that they invited guest entertainers. And these were the entire cast of Jollitown! Yep! Jollibee and his friends Popo, Yum, Hetty, and Twirlie were present. The kids, especially Dindin, were very happy. She danced with them and posed with the kids to have their picture taken. In the photo above, can you spot Dindin? Wow it would really be nice to have all the mascots in one birthday party because Dindin loves them. Anyway, if you hold a party at Jollibee, you are allowed one character appearance. For additional characters, that would be P1000 per character. During Dindin’s 2nd birthday, we were allowed to have Twirlie as per our request, and it was given to us for free because of the amount that we paid. Sometimes, all it takes is some negotiation. During my niece’s birthday party Jollibee and Hetty were there. The kids all had a good time.